Los Angeles-based artist Timothy Nolan delivers contemplative sculpture that is all clean geometric forms, a subtle palate of silver, black, gray, and white, and various surface treatments - mirrored, reflective, flat. Nolan continues his investigation of patterns, repetition, and systems, both made and natural. The work easily draws the viewer into the complexity encompassed, including the exploration of visual perception and construction of illusory versus real space. Evident throughout is the influence of minimalism and cubism; the artist is also inspired by craft and op art. The exhibition features floor and wall sculpture as well as works of silver metallic paper on panel and other two-dimensional pieces. The centerpiece - both literally, as it takes up a large space within the gallery, and figuratively; it's enchanting - is the twenty-foot-long "Pitch." 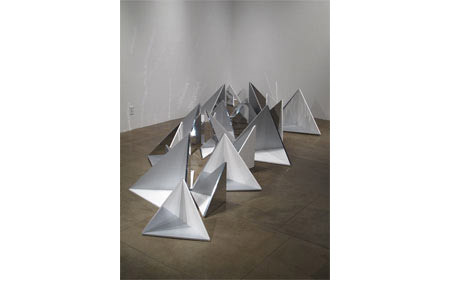 Comprising more than twenty triangular pieces of various sizes, with several of the surfaces mirrored and reflecting off of each other, the work evolves into endless shards and crystalline structures, elegantly getting to the heart of Nolan's interests. In the wall sculpture, "Stack" - which is also made up of a series of over twenty non-identical hard-edged shapes, these composed of printed vinyl on aluminum - geometric shapes in five gray-scale hues also play with our comprehension of light and shadow and the shaping of space; the piece appears to be more three-dimensional than its flat surfaces really are. While Nolan's artwork overall is hard-edged and calculated in appearance, it's not cold. This is meditative work that we not only see but experience.